The recently institutionalised global Performers’ Rights Regime (PRR) aims to improve the economic position of those performers whose work can be audio-recorded and reproduced. Vocalists in Sri Lanka as a significant constituent within the local music industry had hoped that the PRR would make their work more economically secure. 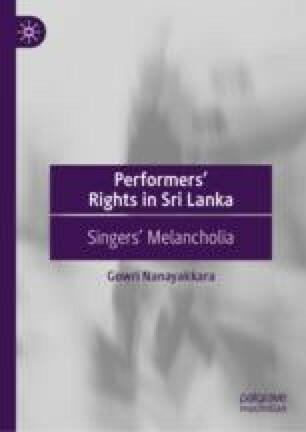 This chapter, as a prelude to the discussion on the PRR’s ability to resolve the singers’ concerns, contextualises the Sinhala vocalists’ concerns grounding them on empirical findings, examining them through the traditional intellectual property theories and thereafter positioning them within the concept of ‘belonging’, a nuanced approach to encapsulate the distinctive situation in the Sri Lankan music industry. This chapter and the monograph are based on the PhD thesis the author submitted to Kent Law School, University of Kent, UK. Parts of this chapter was published as G Nanayakkara, ‘Promise and Perils of Sri Lankan Performers’ Rights: The Royalty Collection in Music (2017) 23(1) European Journal of Current Legal Issues. Frith, Simon, ‘Popular Music Policy and the Articulation of Regional Identities’ in Paul Rutten (eds), Music, Culture and Society in Europe (1996), http://www.icce.rug.nl/~soundscapes/DATABASES/MIE/Part2_chapter04.shtml.